Came back from Utah last night and it's been a day of catching up. Running around. Grocery shopping. Laundry doing. And of course playing with Bill and snuggling with the pups...Wait! Sorry. It's the other way around! Yep, today feels completely discombobulated. I have had to jump right into work mode this morning and just cannot wait to cozy up on the couch tonight and look through all the pics I took this past week in Utah during the Plate To Pixel Book Tour Workshop and the three days spent at Evo in Park City. I miss everything about last week already, including the lack of humidity and the mild temperatures. If you knew the (good) fire burning in my guts right now about everything seen, accomplished, witnessed, made part of, shared with, taught, learned about. Projects set in motion, stories brought to fruition, friendships and connections created. Kuddos to Rachael and Jyl, the founders of Evo for another smashingly well executed conference. I can't wait to share more of it with you later this week. Part of all these good all around feelings started right before Utah when I cooked my first recipe out of my friend Matt Armendariz first and freshly released cookbook "On A Stick". I'd only had time to make a couple of recipes from it but took his book with me on the plane and read from first to last page. In the thick of Summer, his book could not have come out at a better time! The weather sure did not get any milder while I was gone and tonight we got right back into our routine of grilling as much as possible instead of turning the stove or the oven on. We have come to grill everything, even fruits. Stone fruits specifically. Juicy, fragrant, perfectly textured for a little fire action. I realized a few days before hopping on the plane last week that I had gone slightly overboard with the apricots and plums. To use them up, I served a bunch simply cut up with some fresh whipped cream. A little riff off the idea of peaches and cream. And while this was simple and satisfying, there was a little depth of flavor and texture missing. This is when I went ahead and grilled a bunch, following Matt's direction for Grilled Fruit Skewers and served some over vanilla ice cream. I pureed the rest until smooth and made these Apricot & Honey Panna Cotta. They are the perfect blend of smooth and creamy with a touch of refreshing fruity acidity from the apricots at the bottom. A large handful of velvet apricots and plums found its fate much like a dish gets concocted at times. A pinch of this, a dash of that...I was adapting Matt Armendariz's recipe for Chinese Five Spice Chicken Skewers from his book "On a Stick" to use with fresh tuna when the velvet apricot I was munching on flew out of my hand and landed on a little bit of five spice sprinkled inadvertently on the counter top. I wondered what the combination of fragrances would be like and fell in love at first bite. 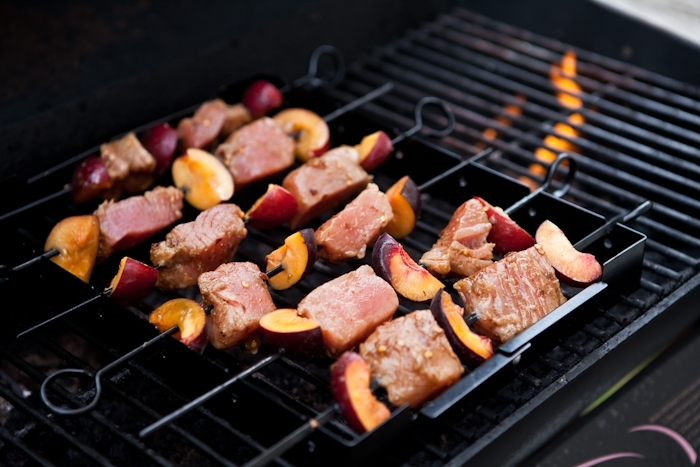 Before I knew it, I was skewering pieces of five spice marinated tuna and velvet apricots and placing them over a hot grill. The resulting dish was the perfect light dinner bite we were craving with such hot weather. Sweet, sour and savory. Hints of anise, lemongrass, cumin, cinnamon bringing fish and fruit together perfectly. I love how the book incorporates super simple to fancier recipes without being difficult or long in preparation. Recipes such as "Ground Shrimp on Sugarcane" and "S'Mores" are especially tempting to me. Others like the "Spaghetti and Meatballs" or "Cinnamon Rolls" on a stick may seem brilliant or crazy to some folks but they turned out to be quite the conversation piece at our latest neighborhood cookout. Always a plus if you ask me. However, these are far and few between and if you look closely, you'll see that Matt took known dishes and reworked them to work on skewers of all kinds. From appetizers to desserts, complete with dips and sauces. Fun. Unpretentious. Entertaining. Beautifully styled by Adam Pearson and photographed by Matt himself. Yes, I consider both of them my friends and mentors and that makes this book that much more fun for me to use. I am seeing many more dinners and parties in our future incorporating recipes and ideas from Matt's book. That makes me beam with pride. Matt is the single most positive person I have ever met in my life and I am constantly learning and inspired by him. This book is an clearly an extension of his fun and delicious side...! Cut the apricots in half and remove the pit. Brush lightly with olive oil and grill over hot coals until tender (about 3-4 minutes on each side). Let cool and puree until smooth in a food processor. Divide the mixture between 6 glasses. In a large heavy bottomed saucepan placed over medium heat, bring the heavy cream and honey to a simmer. When the cream is hot, remove from the heat and whisk in the reserved gelatin until it is completely dissolved. Add the buttermilk and whisk until well blended. Divide the mixture on top of the apricot puree. Let stand at room temperature for 20 minutes and then refrigerate for at least 4 hours before serving to let the cream set properly. Combine all the marinade ingredients together in a small bowl and whisk until smooth. Place the tuna pieces and fruit quarters in a shallow dish and add the marinade. Make sure to coat all the pieces well with the marinade. Refrigerate for an hour, turning the tuna pieces halfway through the process. Meanwhile soak the skewers if using bamboo ones so they don't burn (I used metal) in water for at least 30 minutes. Heat the grill to medium high. Remove the tuna and fruit from the refrigerator and thread onto the skewers, alternating pieces as much as possible. Grill, about 3-4 minutes per side for medium tuna or less for rare. Serve with fresh arugula if desired. Apricots are divine. Great ways of using them! That panna cotta must be exquisite! A lovely dessert. This weekend I was in Mexico City with Penny. I have Food and Light coming up...but I was wistful when I saw the Evo posts. I REALLY wish I could have been there to meet you. Seriously...It would have made my year! That panna cotta looks great with the peaches! my first time to encounter apricots and tuna! I love grilling stone fruits. 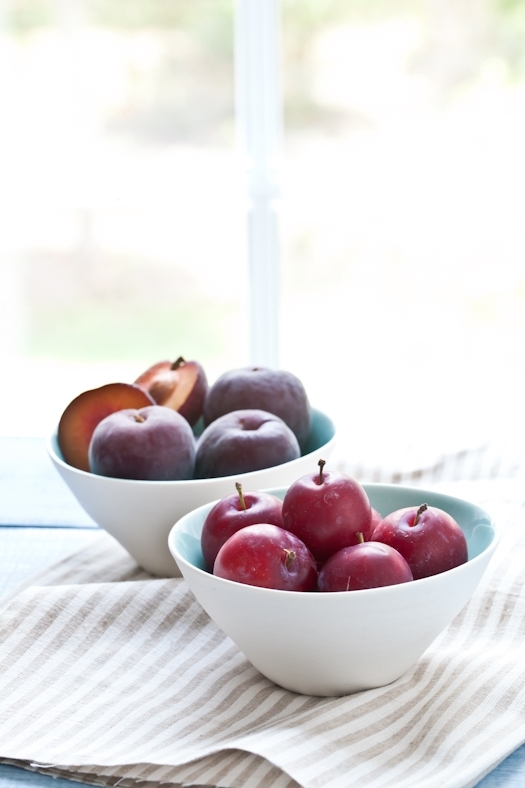 I first tried it with underripe nectarines, and it was the perfect way to bring out the flavor. Now, I think my favorite is white peaches, maybe because they're not easy to get here in New England. The apricot & honey panna cotta looks so elegant. You've got me very curious about "On a Stick" now- must check it out! I'm so inspired by the colors, textures, and lighting in your photos. Something to aspire to! Yum! What a delicious fruit dessert. The photographs are just breathe taking. Lovely. 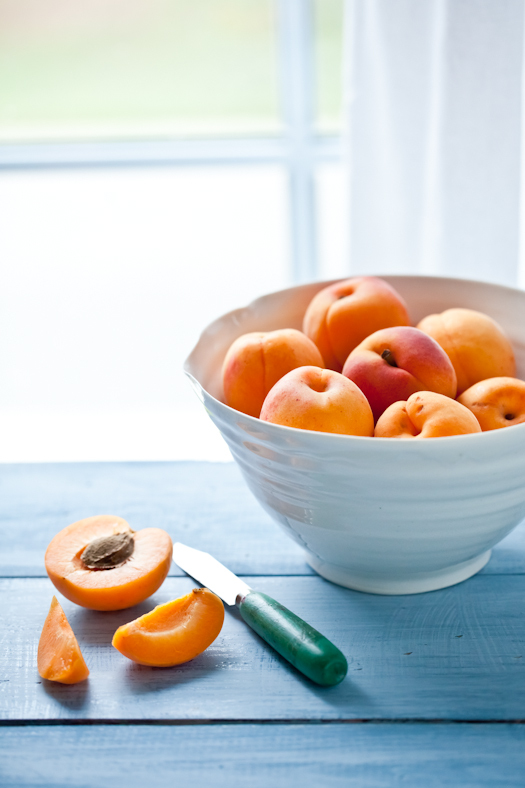 I absolutley love apricots and believe the taste even better when cooked. Somehow this summer I seem to have only enjoyed them raw. I love the idea of grilling them just until softened and then pureeing them. Together with the panacotta this looks like a perfect summer dessert. 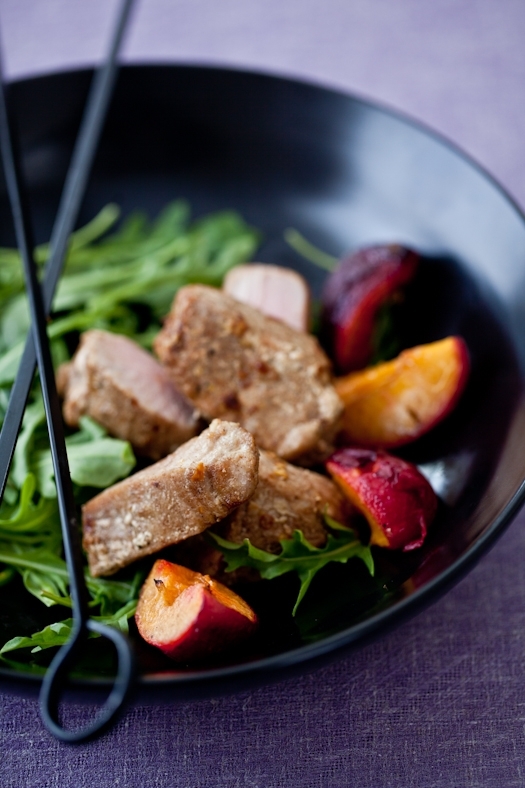 Oh, the Five Spice Tuna and Stone Fruit Skewers looks amazing! I've heard so much about Matt's new Book, I just may have to go buy it now! It was so fun getting to see you in Utah. We do like our dry weather; it makes all the super hot and super cold weather more bearable. Beautiful photos in this post, as always! Averie: writing my book wasn't at all about the possibility of becoming "known" or "rich". It was about sharing what I know with others and hoping they would share with others as a result. I exhale every time I visit your site, Helene. Love the stories and images are beyond fab! Thanks for always inspiring. Btw, the panna cotta is simpoly gorgeous! I just bought your photog. book and am trying to find the time to experiment and learn more about my camera, lighting, etc. Such a challenge cooking for my blog and family and trying to capture the right light toward evening... I love your wonderful photography and hope to improve mine eventually. Doing any photog. workshops on the east coast, northeast???? I'd be there in a heartbeat! I have a new appreciation for food photography and styling after taking your workshops. You truly are amazing. Thank you for sharing your talents and advice. I am excited to practice what I learned. Your photos are always stunning and those apricots are calling my name. Come back to Utah soon. We miss you already! This recipe looks and sounds delicious.. but your photography always takes my breath away. I could look at your site for hours and not get bored. Swoon. That's a great meal! Looks fresh and delicious. Your pictures are gorgeous!! yum, I want to try it all. I have never made Panne Cotta, it always seems so elegant and complicated, but you make it seem quite straightforward. Perhaps i will give it a go. Any ideas what to do with the kilo of cherries i have in my fridge? La panna cotta est une pure merveille! Et je testerais bien ce salé-sucré an brochettes! The panna cotta looks so good. It was a real honor meeting you last week. 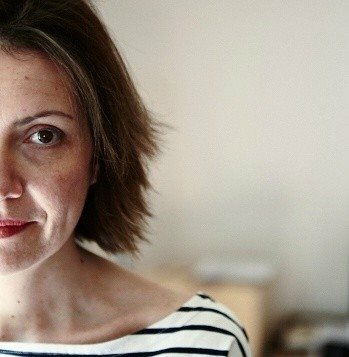 I found you as kind, genuine, and charming in real life as you are on this blog. Thank you so much for everything you shared with us at your workshops! And I hope our paths cross again! Lovely summery recipes. The apricot and panna cotta dessert looks so light and delicious. It was so good to have the opportunity to watch you work, learn from you and, most of all, get to know you a bit better. As for this dish - well, this combination sounds like the perfect combination of sweet and savory. Beautiful, beautiful pictures. I can't wait to get your book in the mail. Welcome back - everything looks delicious! I particularly like the plum skewers! Seriously, can I come take a cooking class from you, as well as a photography class? Do you teach any style photography classes? You are simply amazing! That panna cotta looks amazing! LOL! I like "playing with Bill and snuggling with the pups"! Can't wait to get your book and devour it cover to cover. I have an upcoming cross-country flight and am SO looking forward to learning more and just sit there and read, read, read (just hope I'm not sitting next to someone who wants to chat). I love the addition of the five spice - will have to pick some up as I have yet to try it out. I love Matt's book (and your thorough guide to food photography and styling) and am so thrilled you featured this marvelous recipe. The addition of Chinese Five Spice to these skewers turns this recipe into a dish that I never would have though to make. Tuna? Sure! Fruit? Of course! But to add these spices in here is brilliant. Gorg photos and write-up as usual! Both you and Matt make food perusing so much fun because of your visual approach. Thanks for letting me be part of the Utah food workshop, it was great meeting and helping you influence so many aspiring photographers and stylists. Come back soon, Utah loves you! Marla: this particular one was a gift so I don't know but this one is very similar. Love mine! So easy to use for fish kebabs and other flaky items. Just set the rack on the grill and only turn the handles of the skewers. Mind blowing pics Helene. I just want to grab that glass of panna cotta. It looks pretty and luscious. After reading your review I am looking forward to buy Matt's book. Yum! That panna cotta looks amazing. Fresh, light and sweet. Just what I need! Mmm. fish kabobs with fruit. I love pairing fish and fruit. I just experimented with that 5 spice powder on Dorie's Greenspan's slow cooked ribs with coca-cola. I hope someday I will be skilled enough in the kitchen to play around with flavors in a recipe. Would never have thought of combining fish and fruit. sounds refreshing! Helene this post is gorgeous. 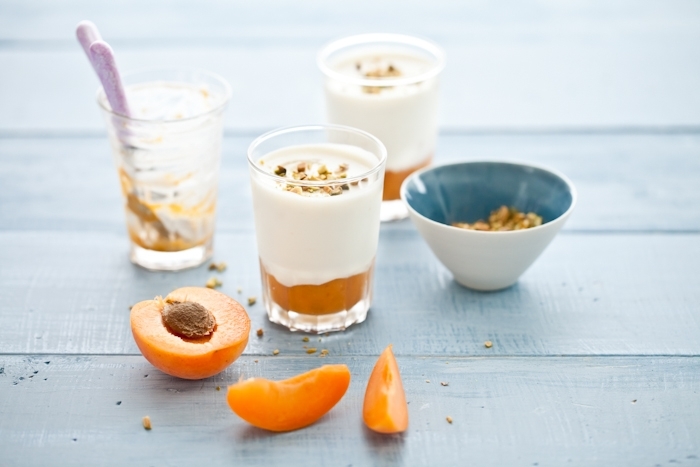 I am obsessed with post apricots and pannacotta so the thought of them together is almost too much to bear! ps your words about Matt and his book are the sweetest. The apricot honey panna cotta looks dreamy! I will enjoy trying this! I'm looking forward to the book Tart Love. I'm sure the photography is stunning! 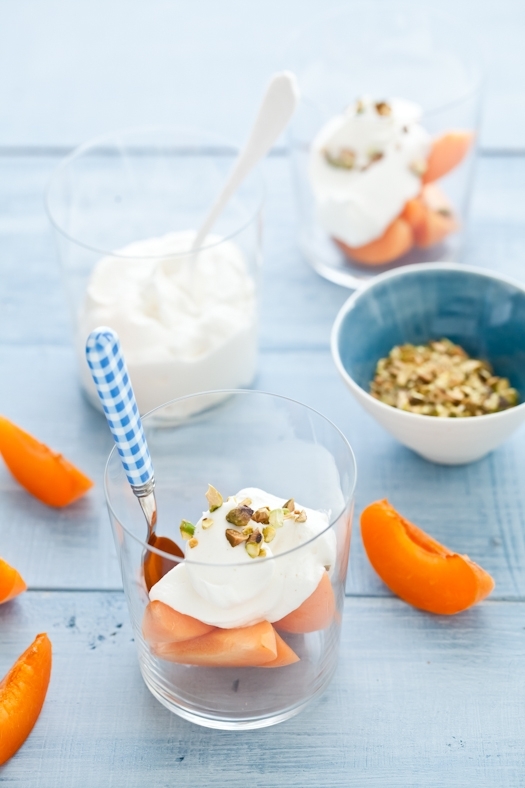 we love this apricot honey panna cotta! gorgeous, as always, and these recipes look just divine. i've been reading other bloggers' posts on your workshop, and it sounds like it was wonderful - i'm bummed that i couldn't go, but it's great to be able to read about it from so many perspectives! This looks really great! And I love apricots so I am going to put this on my to do list for the next weekend. Looks delish. I have plums and apricots dropping off my trees. Now I'm inspired to recreate this feast! I have to admit I rarely eat apricots --- I don't really have a reason why. I just don't seem to buy them or THINK to buy them. But, after this post I am heading straight to Whole Foods to make this. So yummy & fresh looking. All those skewers must be perfect for a barbecue with friends. I'll try them asap. 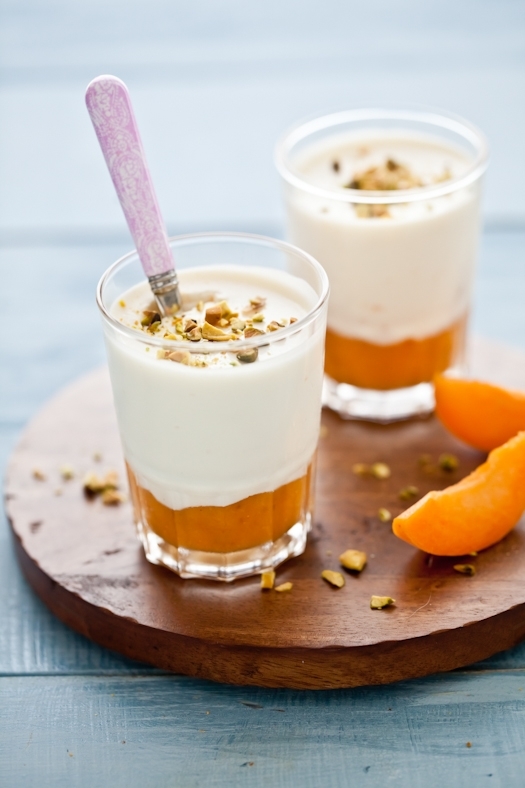 But first, your apricot panna cotta for my Sunday pic-nic! 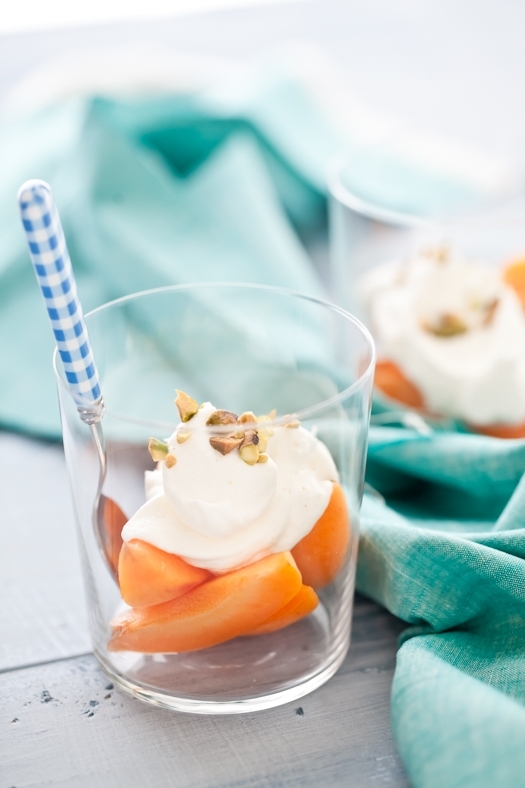 Apricots and whipped cream. It's so simple yet the perfect combination when you're craving something light on a summer day.